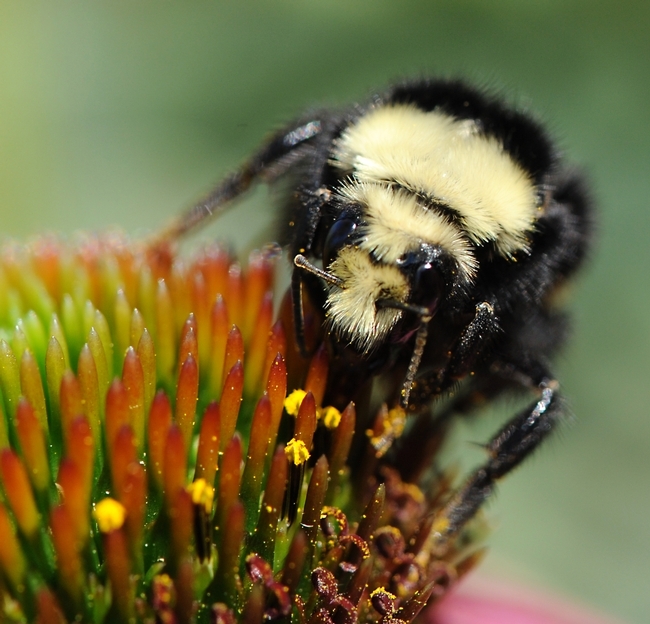 How do bumble bees plan their route to find the most rewarding flowers in the shortest distance? That "is a mathematical puzzle which has vexed academics and traveling salesmen alike," according to an article in the June 29th edition of Science Daily. So lead researcher Mathieu Lihoreau of Queen Mary, the University of London's School of Biological and Chemical Sciences, set out to find why. The researchers monitored the movement of a bumble bee, Bombus terrestris, and published their work in the British Ecological Society's Functional Ecology. How are bumble bees like traveling salesmen/women? Co-author Nigel Rain told Science Daily: "The Traveling Salesman must find the shortest route that allows him to visit all locations on his route. Computers solve it by comparing the length of all possible routes and choosing the shortest. However, bees solve simple versions of it without computer assistance, using a brain the size of grass seed." For the project, the researchers made some flowers more rewarding than others, so the bees had to decide "between following the shortest route or visiting the most rewarding flower first," Lihoreau told Science Daily. "We have demonstrated that bumblebees make a clear trade-off between minimising travel distance and prioritising high rewards when considering routes with multiple locations," concluded co-author Professor Lars Chittka in the Science Daily piece. "These results provide the first evidence that animals use a combined memory of both the location and profitability of locations when making complex routing decisions, giving us a new insight into the spatial strategies of trap-lining animals." Interesting research. Interesting research, indeed. As an aside, foraging bumble bees don't appear to be as navigationally challenged as their traveling human counterparts--many of whom would not dare travel without GPS, maps, a front-seat passenger skilled in navigation, or handwritten notes from Aunt Mary. Just wondering--might this research also correlate with human travelers' fast-food stops? Why do some hungry travelers stop at the first fast-food restaurant, without considering what heart-healthy, nutritious foods lie ahead?